This graveyard cake is simply spooktacular. The recipe uses crushed chocolate sandwich cookies (like Oreos) for the dirt and vanilla sandwich cookies for the tombstones. But the best part is decorating the graveyard. Kids love using pumpkin candies and candy corn for a "cute" graveyard look, but if you prefer a spookier one, decorate the cake with chocolate spiders and goblins. Spread chocolate pudding over the cooled cake. Top with crushed chocolate sandwich cookies. 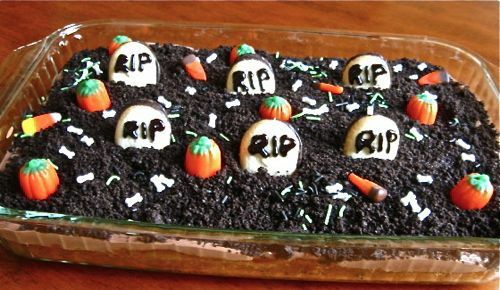 This is the dirt for your graveyard cake, so you want to try to cover the pudding completely. Make the tombstones: Cut the Milano cookies in half widthwise. You can use the whole cookie if you prefer, but it makes the cookies more stable if they're shorter. Write RIP and other fun Halloween graveyard sayings on the top third of the cookies with the gel icing. Press cookies into the cake at intervals, so they resemble tombstones. Place pumpkin candies and candy corn on the cake. Sprinkle the cake with bone sprinkles.